IMAX VR might just be the cinema experience of the future | What Hi-Fi? The new virtual reality offering drops you into a range of immersive experiences, and includes VR takes on films such as Star Wars and John Wick. IMAX has unveiled its first ever IMAX VR centre. The next-generation cinema replaces IMAX's signature big screen with a series of 14 pods equipped with virtual reality headsets and controllers. Slip into one, and you'll become immersed in a virtual reality experience. These 'experiences' promise to be a cut above your usual VR fare. For starters, they include the use of controllers and wearable sensors like rumble packs, so you can feel the impact every time you're shot by a laser. Wielding a lightsaber? You'll feel the weight of the weapon in your hand. Secondly, they include film tie-ins, such as Star Wars: Trials on Tatooine and John Wick Chronicles. Other demos available include games and apps like Tilt Brush and Universe Sandbox. But IMAX will also commission its own original VR content. It hasn't done so yet, but it's rasied $50m to fund the development of four new VR centres across the US and China. 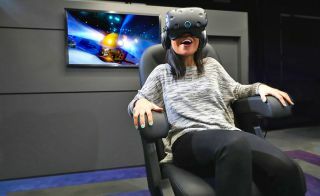 At present, the centres mostly use the HTC Vive headset, but according to UploadVR, a handful of more experimental Star VR headsets are also available. IMAX also announced it has invested in Dreamscape Immersive, an LA-based start-up that focuses on location-based VR. Other investors include Steven Spielberg, Twentieth Century Fox and Warner Bros. Speaking to Variety, IMAX CEO, Richard Gelfond, said the new VR centre was just one step for IMAX in becoming a more established entertainment brand: "One of my wishes is that a couple of years from now, people think of us not just for the experiences we provide now, but as a much broader entertainment company."